From sound at your wedding to entertainment and room lighting at your reception, DJ4U can do it all! 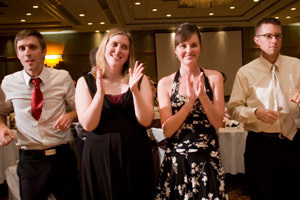 We are the perfect DJ Service for your wedding in Peoria, Bloomington and Springfield. From sound at your wedding to entertainment and room lighting at your reception, DJ4U can do it all! We have a wide variety of services to help make your special day run smoothly and a creative team of professional entertainers that are sure to be a hit with you and your guests. Area brides have awarded us The Knot magazine's coveted "Best of Weddings" award for the past 3 years and we've won the WeddingWire Couple's Choice Award for four years in a row! It's no wonder so many people are talking about DJ4U Mobile Entertainment. We also have an A+ rating with the Better Business Bureau and promise to make sure your day is perfect. If you have any questions as you browse through our wedding services, please feel free to call or e-mail us from our contact page. We look forward to working with you and showing you everything we have to offer for your special day! Watch this 2 minute video to find out why couples just like you love working with DJ4U. Download our free PDF interview with DJ4U Founder Jason Parkinson. The Classic Reception Package is our entry level package. It’s perfect for a smaller afternoon receptions! This package includes all of the basics to keep your dance floor moving to the music you’ve selected. We provide up to 5 hours of playing time with this package (our set-up time is always free) and a sound system to handle up to 100 people! We’ll also provide a microphone for speeches and toasts! Not only that, but you’ll have access to our Online Planning System to pick out your favorite songs and plan your reception. The Silver Reception Package is our most popular package. It really packs a huge punch! You pay only one price and have DJ4U for as long as you need us at your reception. We’ll provide a sound system for crowds of up to 450 people and bring our high-energy DJ party lighting. You’ll also have use of our wireless microphone for speeches and toasts. We’ll set you up with access to our Online Planning System to help you plan your reception at your leisure. The Silver Package is perfect for medium to large receptions and you don’t have to worry about how long you have your DJ. The Platinum Reception Package is the largest DJ package we offer and includes 4 hours of unlimited photo booth service! We’ll provide an amazing sound system for crowds of up to 700 people and bring our DJ party lighting package. You’ll also have use of multiple wireless microphones for speeches and toasts. We’ll set you up with access to our online planning system and assign a personal DJ4U Planning Consultant to help you with the planning of your reception. The Platinum Package is for those couples who really want to impress their guests with the level of entertainment! Add some fun to your wedding reception with an open air photo booth! Only DJ4U photo booths come staffed with a professional entertainer as the attendant! The overall success of your photo booth depends on the person you have running it! Great photos and great memories are a direct result of the company you hire. Trust DJ4U for your special day. Elegant room lighting from DJ4U creates a dramatic and beautiful feeling to your perfect wedding reception. Our lighting team can create the perfect atmosphere that is designed to take your breath away. We are able to match your wedding colors, or help you choose a color that will compliment your pallet. DJ4U offers a wide variety of services for your Wedding Ceremony too! We can provide sound for any size wedding in any size building! We have wireless microphones for the exchanging of vows and a great variety of music that will fit your ceremony perfectly! If you need sound services at your wedding, you need DJ4U! Imagine the look on your father's face when he hears his little girl's pre-recorded special message or letter playing over the loud speakers during the father daughter dance at your reception. This is a real tear jerker and will help to let dad know just how special he is to you. We'll have you come in (must travel to Peoria) and record a special 20 second message to your father about a week before your wedding. Then we'll mix it in post-production with your special father/daughter dance song and play it during your reception and provide you with a copy on CD to give to your parents after the big event. This is the perfect surprise for your reception! Our concert style premium confetti launchers are designed to give that extra element of flair to any wedding ceremony or reception. Perfect for use during the exit song after the wedding ceremony, or for use during your reception, our professional cannons are available with several different combinations of confetti and streamers. Don’t forget that using confetti is a great way to build excitement with any crowd! DJ4U Mobile Entertainment is the only company in the area that offers this service to our clients! At your reception, we can make a live digital recording of your introductions, toasts, speeches, and special dances and master it to a keepsake CD for you to take home with you that night! That's right! You don't have to wait weeks to get this like you do with your photos or video. We'll provide you with a CD that night!